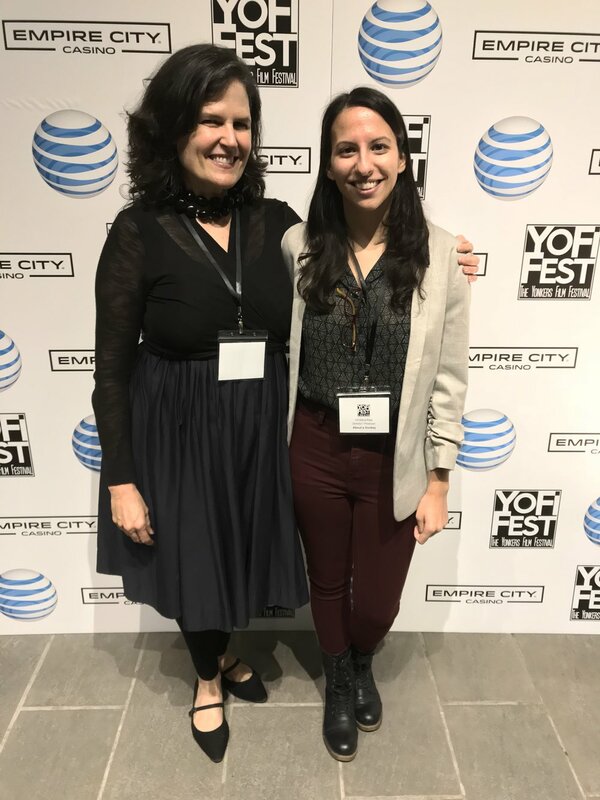 Last weekend was our About a Donkey screening at YoFiFest. It was my first time screening at the festival. I decided to submit because a few filmmaker friends recommended it as a festival with a nice & supportive team, and as one close enough to the City to not be a bad commute, but far enough that it may attract locals in a way that most City festivals have a hard time doing. I figured we’d get a nice sized crowd, since there doesn’t seem to be too much going on in Yonkers regularly, particularly in the arts. Unfortunately, though, that wasn’t the case. I’ll start with the good. The festival directors were really organized and communicative leading up to the festival. I found them and the overall staff to be nice and welcoming on opening night, where there was a great party with free food samplers from local restaurants and an overall filmmaker-friendly vibe. Opening night had a solid turnout of maybe 100 people (of what seemed like a decent mix of filmmakers and non-filmmaker locals). The 3 shorts that screened and the feature were all well done, and showcased in a nice theater space. Overall, from what I was able to see from the programming, I think they have good taste with a nice mix of true indies and only a couple higher profile invitationals. All of their venues are within walking distance from each other. The Q&As are thoughtful and well-run. And the Fall foliage in Yonkers is definitely a sight to see, which makes visiting the area via a scenic train ride from Grand Central not bad despite there not being too much else to do or see in the general area of where the films screen. Now for the not so good. Aside from opening night, plus the high profile features with celebrities and the couple local features shot in Yonkers, the attendance was very low. Most features, such as ours, averaged 12 people in the audience, including the filmmakers. Some fared worse than that. And even the shorts blocks; while having 35 to 40 people in the audience is by no means bad, it’s not great when considering the blocks featured 10 to 12 films each. I was surprised because the festival presented itself as having strong recognition in the community; but I attended enough screenings (and inquired about others from other filmmakers) at each venue at varying times of day, and found that, for the most part, it was just filmmakers and friends/family of filmmakers in attendance, with small exceptions here & there. All that said, no one walked out of the movie, which is either a testament to the politeness of this group of people or maybe the overall enjoyment of the characters and story. To be honest, I’d probably have to walk out of a dialogue-driven film that sounded like that, even if I liked aspects of it. I just found it painful to sit through, not only because I knew my movie doesn’t/shouldn’t sound that way, but the heavy bass was truly hard on the ears. Despite that, to my surprise, people seemed to genuinely enjoy the movie. Filmmaker friends came over after the Q&A to compliment the production design and color scheme (I share that compliment with DP Peter Westervelt & Art Director Nicole Solomon), the authenticity of the family — both from a visual perspective as well as acting & chemistry, and the overall way the ensemble stories were weaved seamlessly together. People called it sweet and charming, and a really fun and relatable family dramedy. The locals in the room had great inquiries and thoughts during the Q&A, which can be watched below. Getting to speak with them made me feel a bit better. After the screening, the technical director was able to rewire and fix the speakers. I’m glad I was able to save other filmmakers from my experience (my friend’s feature in the same room the next day sounded great), but I wish they had done a tech test after they set up the room that morning before jumping into the day. I’d be lying if I said I wasn’t annoyed & disappointed that that wasn’t done … and that no one seemed to notice during the 2 hour block that happened in the room before my screening. Patty, the festival director, was really apologetic. I can tell she works hard to run a smooth ship, and she was really frustrated that such a major ball was dropped. She tried to make it up to us by offering us another screening. I appreciated it but ultimately turned it down because the only people we knew attending the fest had already experienced it at the first screening, and, considering the turnouts overall, I didn’t have faith in the festival attracting any locals with a last minute screening. I figured I’d just end up sitting alone in an empty room whereas a local filmmaker with friends & family in Yonkers would probably appreciate the extra slot far more. All in all, I like the people who run the festival despite their mess up (tech issues happen with such a big operation sometimes, I get it), and I really enjoyed the conversation with & reactions from the few locals at our screening. And, ultimately, I had a really good time at the festival because it gave me a reason to spend a bunch of time with Katherine, who’s just such a great person and movie-viewing partner (though that’s really more to the credit of our friendship than YoFiFest specifically), and get to see Ben and meet his brother (though only briefly, unfortunately). But, aside from those pros, I don’t think the festival has too much to offer someone not from Yonkers. Without local community engagement, I feel I essentially reach the same people (filmmakers) I’d reach at closer festivals in the City; and I can get the upper NY Fall foliage fix from the Adirondack Film Festival (along with all the other perks that that festival offers). So YoFi doesn’t make my personal list of top festivals worth attending. But maybe, as they continue to grow and gain a foothold in the community, it could be worth it a few years from now. Yonkers is not vegan friendly (another con). This is the first time I have nothing to report.